Home / Allgemein / Sector #20 – Horizontal Ground Night feat. 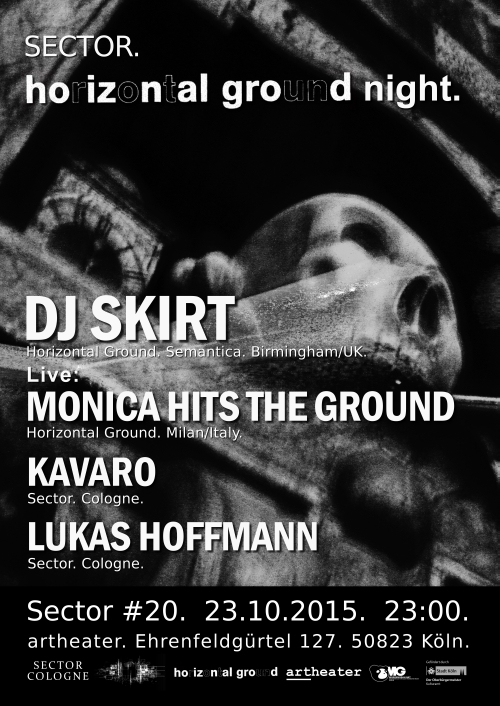 DJ SKIRT, Monica Hits The Ground – Live 23.10.2015 Artheater CGN. Sector #20 – Horizontal Ground Night feat. DJ SKIRT, Monica Hits The Ground – Live 23.10.2015 Artheater CGN. After the summer break we start the club season with the 20th edition of Sector at Artheater Cologne. For this Horizontal Ground label night we invited DJ Skirt from Birmingham/UK for an all-vinyl dj set and Monica Hits The Ground from Milan/Italy for a live set. This time they will get support from the Sector residents Kavaro and Lukas Hoffmann.